Tesla’s ridiculous doors and speed are leading to tomorrow’s family car. My eyeballs feel weird. It's the fault of Tesla's Ludicrous mode. 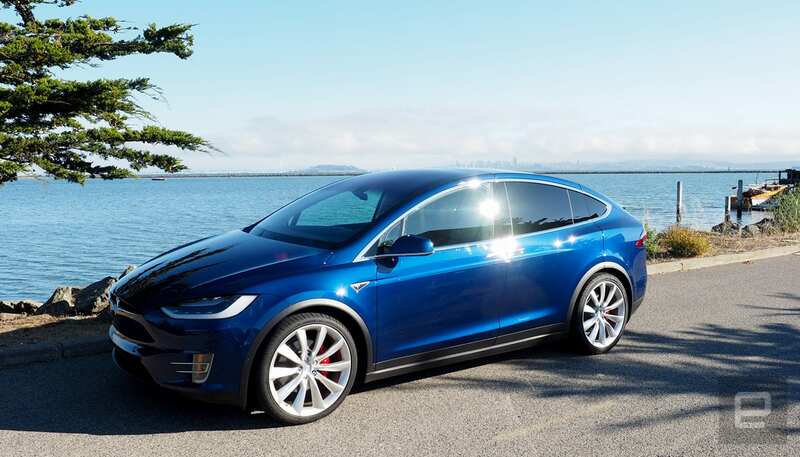 With the feature enabled the Model X P90D is the world's fastest SUV -- launching from zero to 60 in 3.2 seconds. Sure that jolt of acceleration will fling you back into your seat, but what I wasn't prepared for was how the g-forces affected my eyes as the acceleration seemingly pushed my corneas into my skull. Like the car itself, it was at first unsettling, but once that feeling passed, it was a hell of a ride. Even with those ostentatious Falcon Wing doors. The (nearly) eye-popping boost of supercar-esque acceleration from Tesla's $10,000 Ludicrous mode option is essentially an expensive party trick. For the price of a used Honda Civic, you can impress your friends and make sure you're always the quickest car leaving the stoplight. But the real reason to buy a Model X (or any Tesla vehicle) is the battery under the floor, the sensors that make it semi-autonomous, the improving build quality after some initial Falcon Wing door missteps and the charging ecosystem. At the heart of the car is Tesla's electric power train and battery. The automaker is currently ahead of every other manufacturer when it comes to range. The P90D I tested can go 250 miles before dying. Of course that depends on how you drive, terrain and how much weight the SUV is dragging around town. During my trips around the city (including priming the battery for Ludicrous mode bursts) and a round-trip drive to Reno from the Bay Area, I averaged about 220 miles. Keeping the SUV powered up wasn't a problem with all the chargers scattered throughout the Bay Area. But to really get the Tesla experience you have to use one of the company's proprietary Superchargers that are free for Model S and X owners. I went from 32 percent charge to 92 percent in 40 minutes on one of my trips. It's far quicker than the hours it usually takes fill the battery of other EVs with regular chargers. 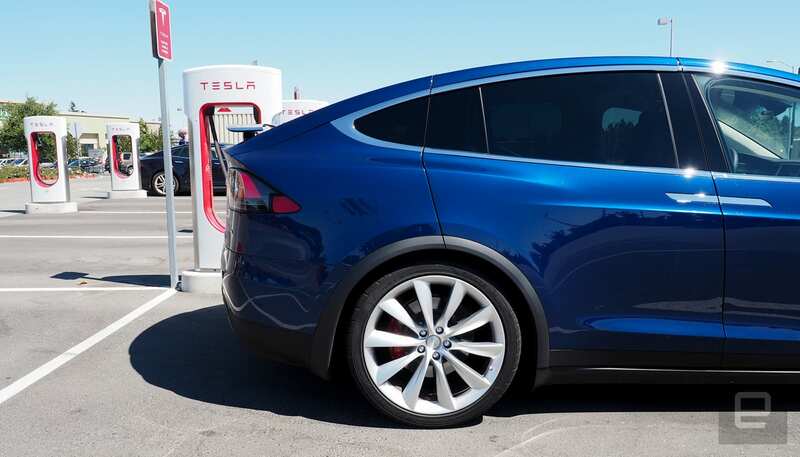 The Model X will support those slower industry-standard level 2 chargers. But, you have to use an adapter that ships with the car. It also comes with a home charging system that if you plug into your regular outlet will take more than 24 hours to go from zero to EV hero. The truth is, the battery technology and the charging ecosystem are incredibly important to Tesla. The company is even building a giant factory in the desert to make sure all its cars stay charged. But it's also jumped feet first into the semi-autonomous driving world with Autopilot. 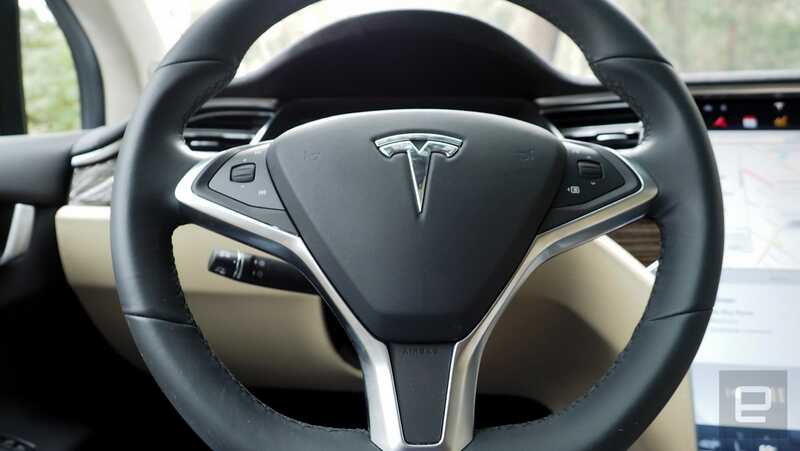 While adaptive cruise control and lane assist are becoming prevalent on luxury vehicles from Audi, Mercedes, BMW and Cadillac, Tesla's system still feels like the most polished and ready for the road -- that doesn't mean it's close to being out of beta or that the driver can use it as an excuse to start texting friends. I felt confident that the Model X would stay in its lane correctly and track the vehicle in front of it about 90 percent of the time. But, there were moments when I felt that if I hadn't taken control, I would have hit a median or another car. At one point the system got confused when trying to track a white truck, on a white road with a white concrete median running alongside it. It tried to follow all three simultaneously, and eventually I had to take control of the car. Still, when it is working, it feels like the future. For example when stuck in gridlock, it lowered my stress level about 80 percent. Like most people, I despise the hours wasted sitting in traffic. Although Autopilot didn't give me that time back, it did make the experience a bit more bearable by tracking the vehicle in front of me and keeping the car in its lane, giving me the opportunity to relax while still keeping my eye on the road. It's a reminder that when cars are fully autonomous, commutes won't make you make you want to rip your hair out with rage. But, there are moments when having the car "drive for you" could lead to bad habits. At times when I became too comfortable with Autopilot and let my eyes linger on the giant center console too long. 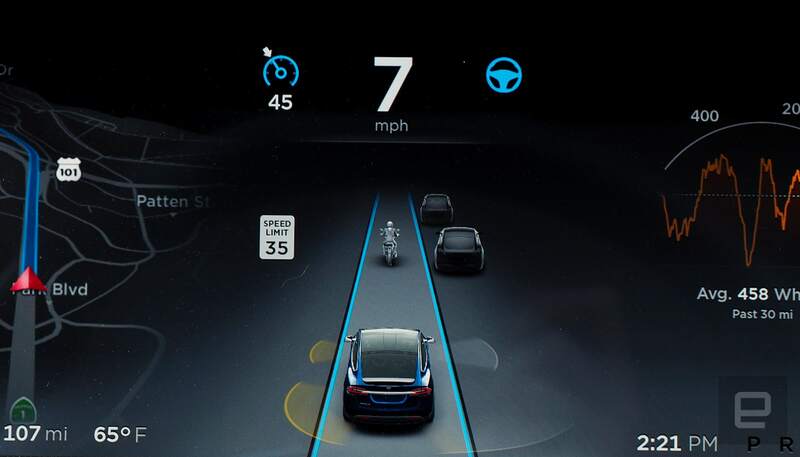 Features like Autopilot are wonderful, but we shouldn't to trust our lives to robot cars just yet. Keep your hands on the wheel and eyes on the road -- even if that means disregarding the gigantic dash tablet. There are very few buttons outside of the steering wheel and column stalks; the 17-inch display controls nearly everything. A giant screen makes sense for navigation, media, energy data and accessing options like Autopilot, ride height and sensors/camera. But for stuff like lights and climate control, it's less than ideal. I don't want to hunt and peck to adjust the air conditioner and or turn on the fog lights. I'm a fan of tangible knobs and buttons for items I'll be adjusting regularly or need to access quickly. That said, navigating the menus and apps presented less of a learning curve than expected. I was tapping away raising and lowering the suspension height and adjusting the steering from sport to comfort while cruising through town after just a few days. Yet with all that control at my fingertips, it's disappointing how the car handles media. Playing music from your smartphone requires you to sync your smartphone via Bluetooth. Once that's done, the only controls available in the Model X media app are volume (which goes to 11) and skipping forward or back. That's it. Everything else needs to be handled on the phone. There's no support for Android Auto or CarPlay or even third-party apps like Spotify. The Model X is basically a giant Bluetooth speaker with a really nice screen which might be fine on an entry-level compact car. It seems out of place on a luxury vehicle. Once you get away from the technology that permeates Tesla and its vehicles, the Model X is at its core an amazing SUV to drive. The handling feels oddly lighter than the Model S sedan and, thanks to the always-on torque of the electric motors, you'll never want for acceleration. Body roll (the amount a car leans) around corners was less than expected and experience felt more like driving a sports sedan than a sport-utility vehicle. The styling, while polarizing, grew on me. I'm a fan of the front end that looks futuristic and bland at the same time. The rear of the car still feels too heavy design-wise. Some passengers entered the car ambivalent about its looks but once they got out and saw it at certain angles (usually from the front) decided it that "on second thought" it's something they would want in their driveway. One opinion that stayed constant was how people felt about those Falcon Wing doors. They either loved them or hated them. But everyone still wanted to see them open, which was initially a problem because Tesla inadvertently gave us an early build of the Model X to review. After one of the doors broke, they swapped out the SUV with a more current version of the car. This "newer" Model X displayed enough differences in the dash cluster and cab to make us feel comfortable that the first car wasn't just a lemon. 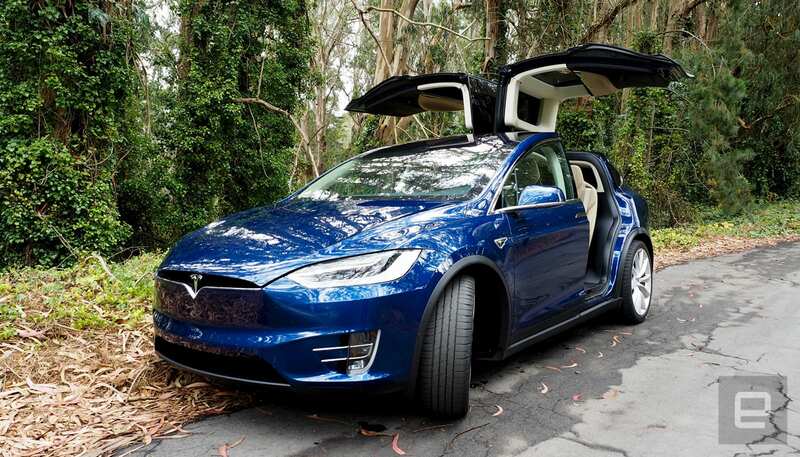 That said, the Model X we eventually received had solid build quality, and the doors opened and closed without issue approximately 120 times during our tests. And, while I'm still not a fan of doors that open up like I'm in an episode Miami Vice or 2000s music video, the Model X does give me faith that the Model 3, the $35,000 Tesla for the average person, will be a well-made car that also happens to change the world of driving with its electric power train. 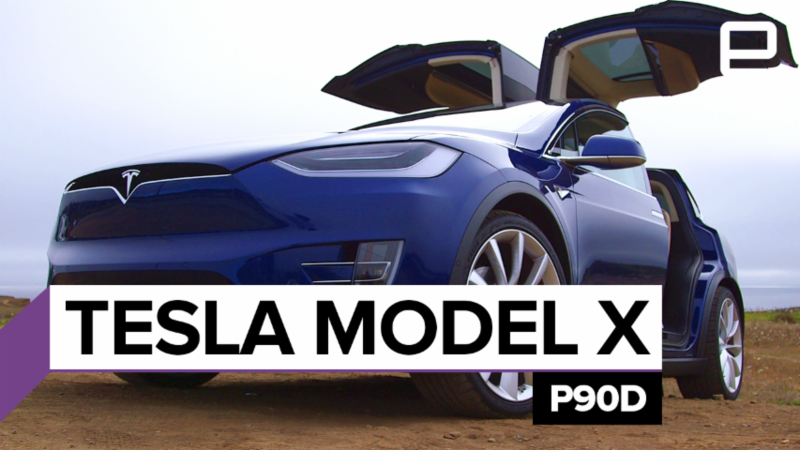 The Model X P90D that we tested on the other hand is expensive. At $132,000 it costs more than any of the homes I grew up in. But at its core, it's an outstanding vehicle both on the technical and automotive levels, from a company that's maturing quickly as it tries to complete Musk's master plan to bring EVs to everyone. It's an SUV that's a blast to drive without the nagging concern in the back of your mind that you're slowly destroying the planet. But more importantly it's part of an evolution that could lead to a mass-market family car that runs on electrons instead of dead dinosaurs.